s::can monitoring devices are used to monitor nitrate and dissolved organic matter. 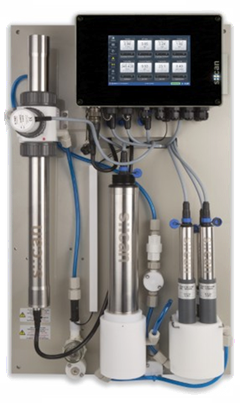 In addition the systems can be used to measure turbidity, total suspended matter and total-phosphorus. s::can spectrometers need little maintenance. The system does not have any moving or parts that wear out. The basic measurement parameters are: turbidity, suspended matter, nitrate, nitrite and organic compounds like TOC, DOC, COD and BOD. The system can be used to monitor the optical spectrum and rapid changes in the spectral shape. Additional parameters (conductivity, pH, etc) can be added to the same system. The system is suitable for water monitoring of agricultural waters, industrial waters and drinking water together with monitoring at waste water facilities and in the process industry. The system can operate both in clean and waste waters to detect optical tracers and contaminants. Several systems have been sold for research and academic studies.